Evolving and moving our system forward in order to meet customer needs and demands will continue to remain a top priority for SkyTouch. SkyTouch Technology, provider of the most widely used cloud-based property management system (PMS) platform for hotels, today announced that it has added a full-featured sales and catering interface to its SkyTouch Hotel OS platform. Offered in partnership with Simple Solutions, the cloud-based Sales Tracking System (STS) interface represents another step taken by SkyTouch toward making its Hotel OS more enhanced to meet user needs. This latest interface will help users improve efficiency and drive revenue by automating essential hotel sales and catering tasks, providing quick access to key data, and facilitating a better customer experience. The SkyTouch Hotel OS platform is designed to be a single repository from which hoteliers can manage multiple aspects of their property or property group. 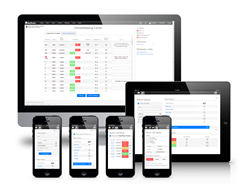 In addition to fully integrated property, rate, and distribution management, SkyTouch offers more than 125 interfaces to streamline hotel operations, with the new STS interface rounding out this offering. SkyTouch remains committed to responding to what customers need and want by building preferred interfaces into its Hotel OS based on industry-standard HTNG messaging. The company plans to continue to expand its interface capabilities in order to meet the evolving needs of hoteliers and the demands of the hospitality industry. SkyTouch Technology offers cloud-based technology solutions helping more than 5,700 hoteliers improve their efficiency and profitability. The SkyTouch Hotel OS solution is an affordable, full-featured platform providing property, rate, and distribution management tools in use by more than 58,000 hospitality professionals around the globe. The SkyTouch Technology team brings more than 1,000 combined years of hospitality industry experience and an award-winning training program to the marketplace – serving customers in eight countries. For more information about SkyTouch Technology, visit http://www.skytouchtechnology.com. SkyTouch, SkyTouch Technology, SkyTouch Hotel Operating System and SkyTouch Hotel OS are proprietary trademarks and service marks of SkyTouch Solutions, LLC. ©2014 SkyTouch Solutions, LLC All rights reserved.